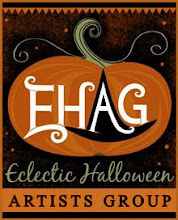 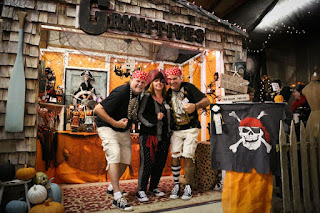 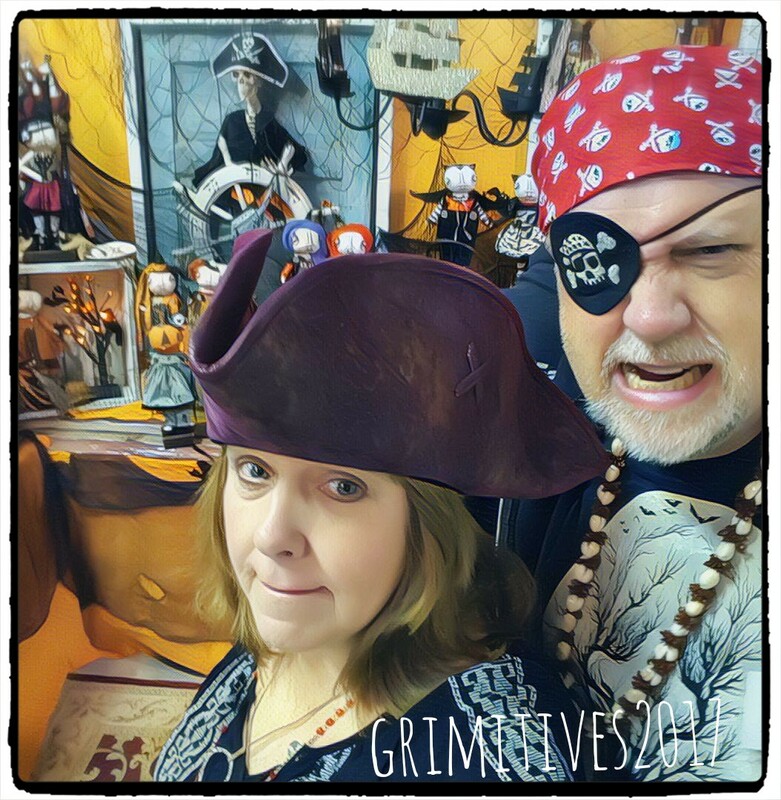 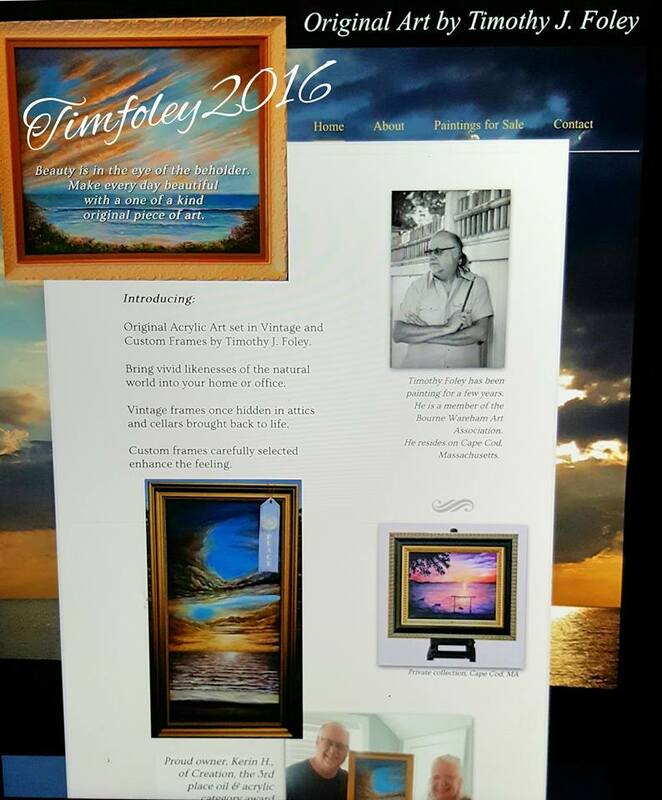 the premiere online Halloween Art group's selling site! and bird nest with speckled eggs! from top of hat to her base. Her hair is black mohair with a braid on one side. 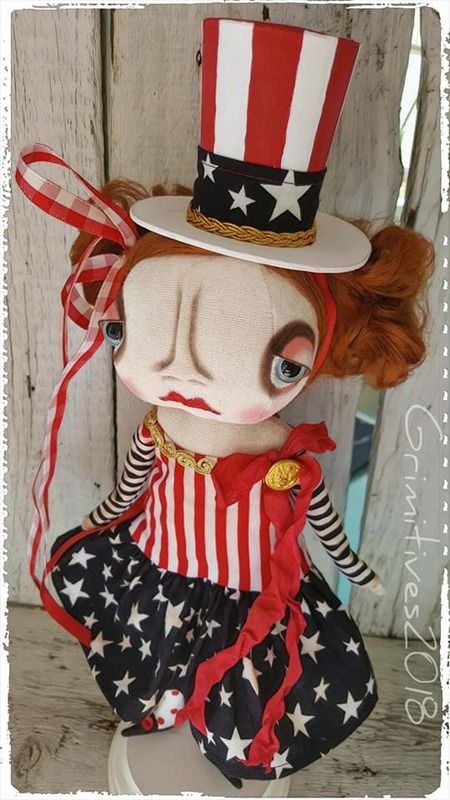 Her hat is tied to her head and can be removed. 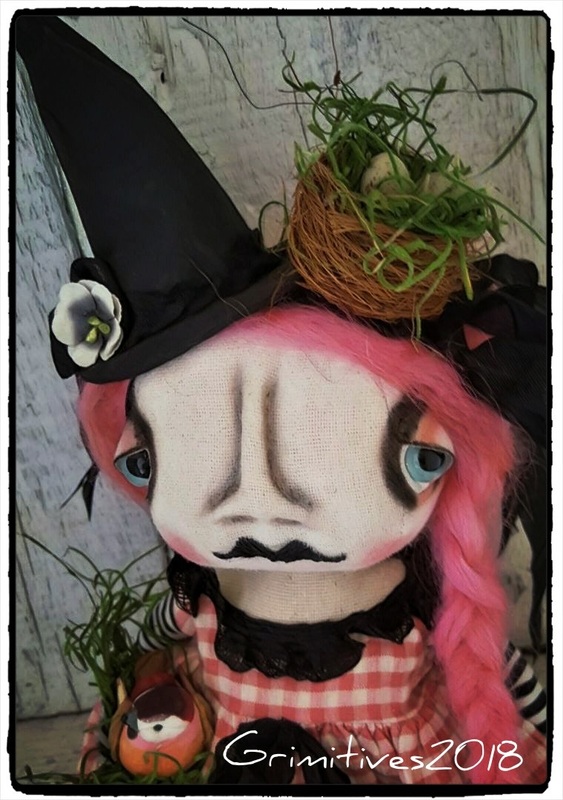 Her bird's nest is pinned to her hat and can also be removed. Witch Sofia Twigg is a one of a kind! 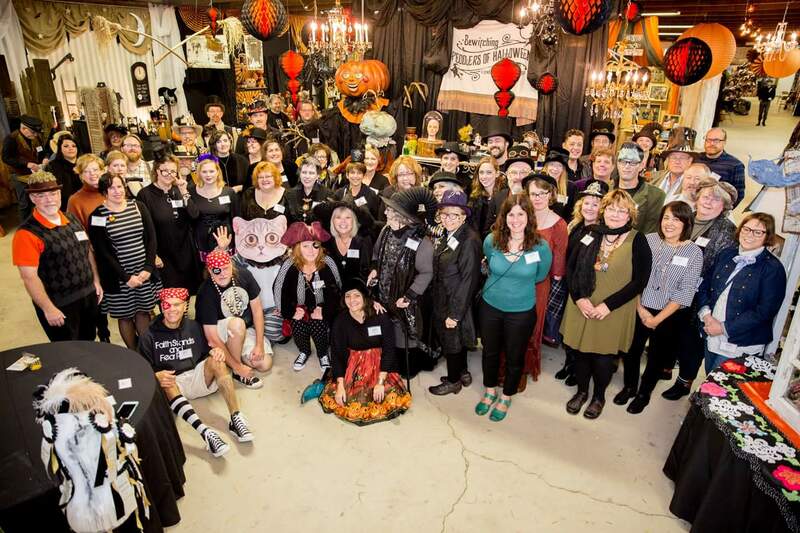 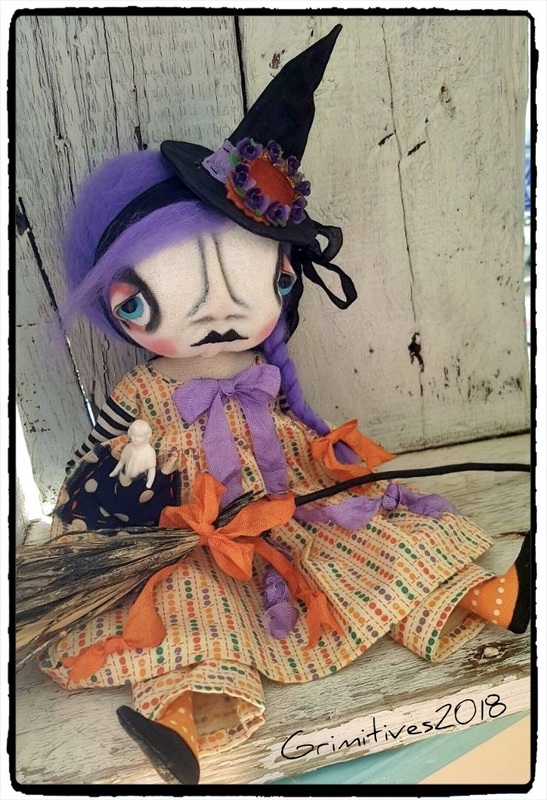 Witch Sofia Twigg has been adopted. 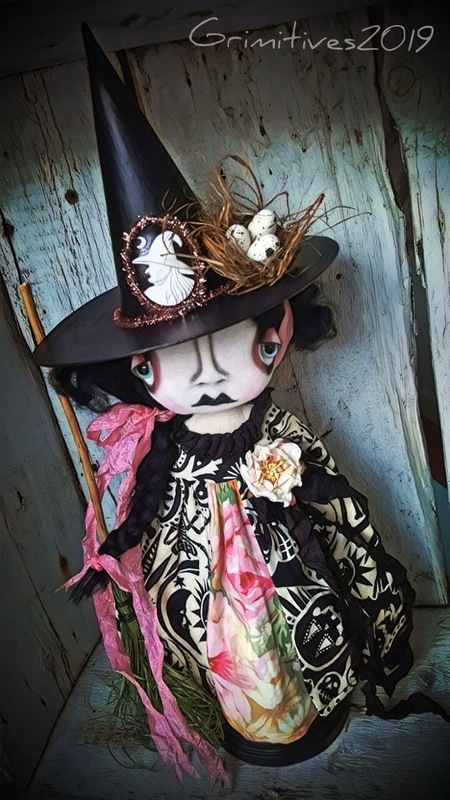 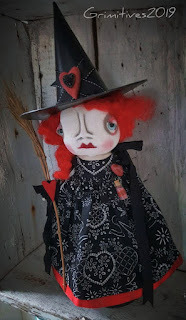 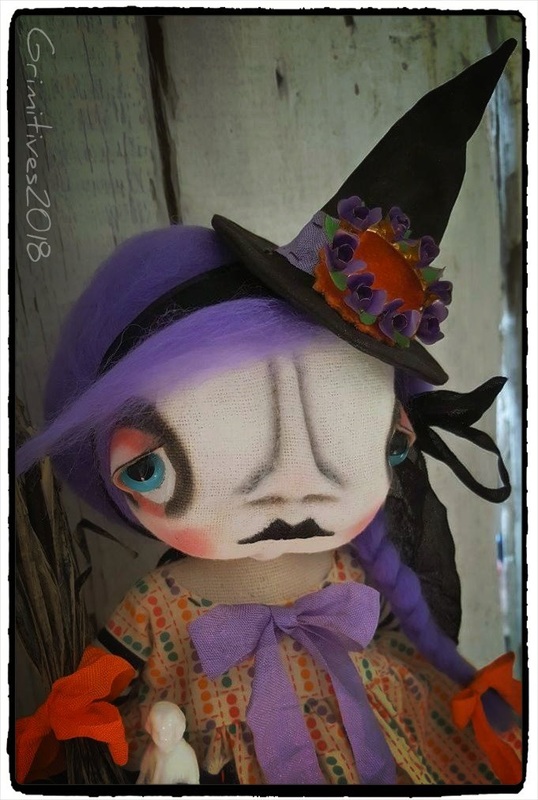 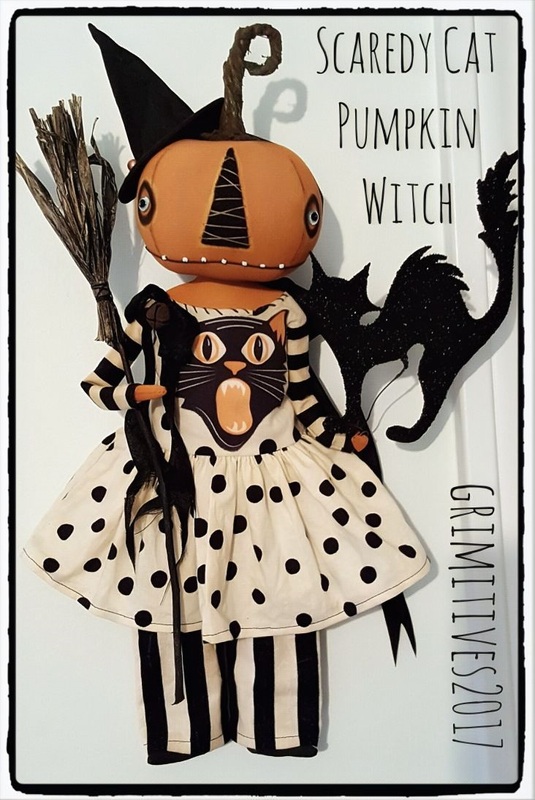 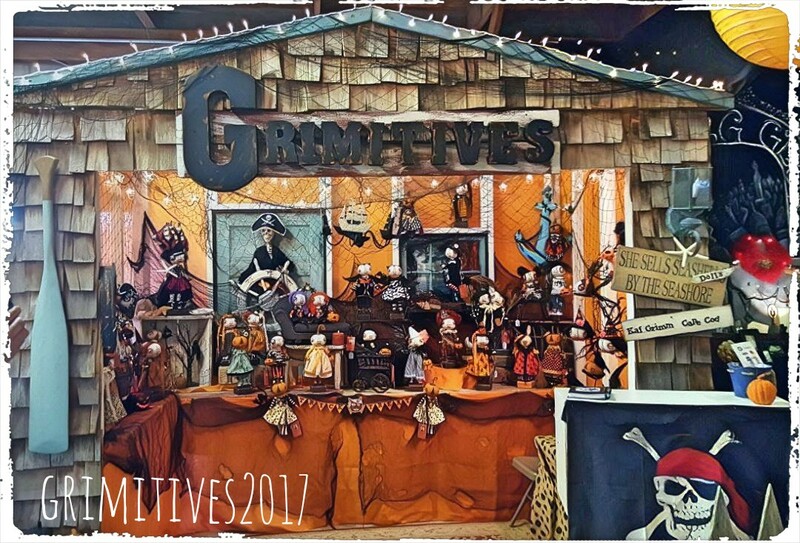 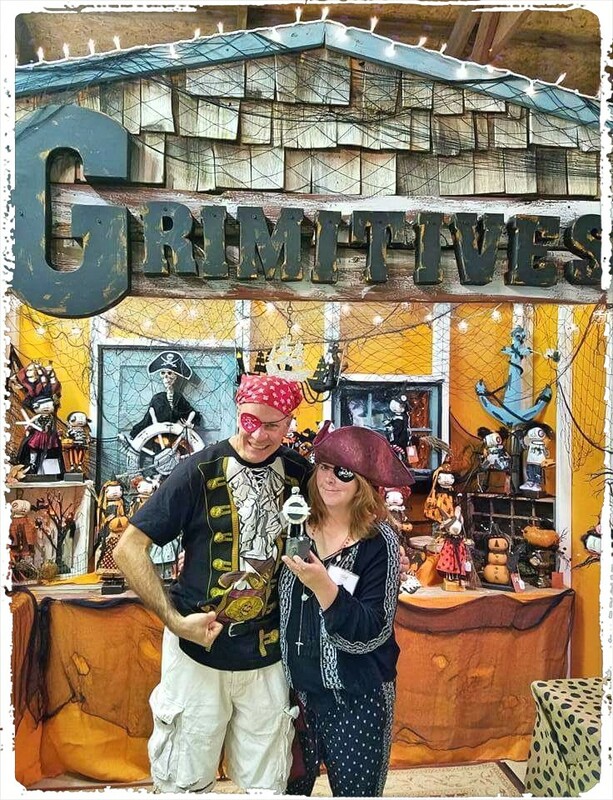 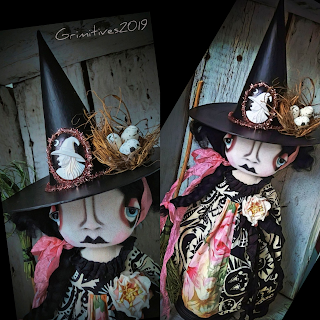 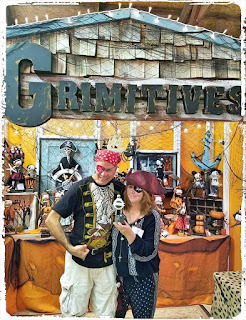 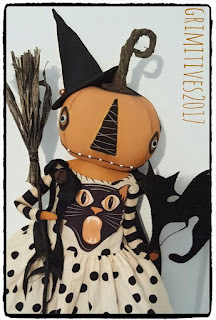 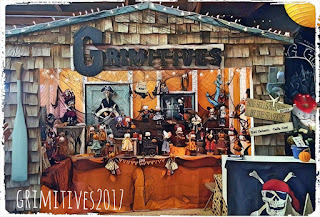 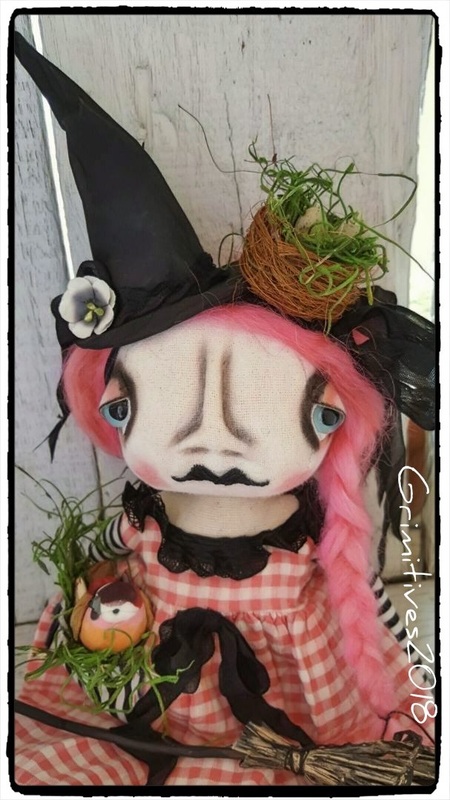 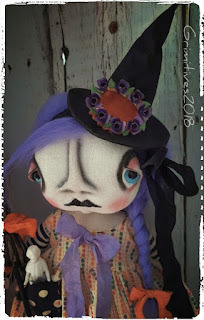 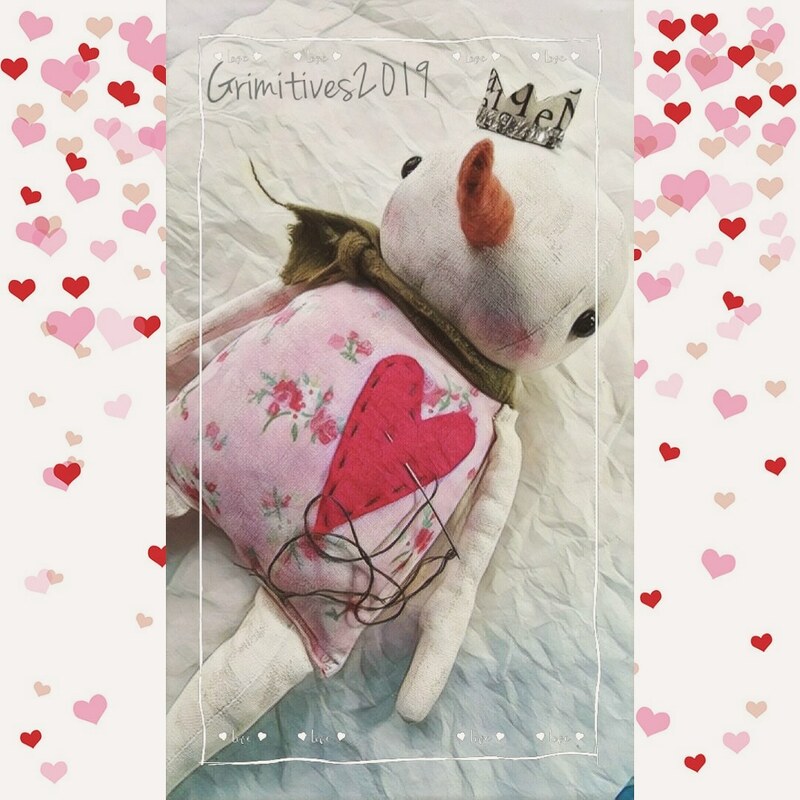 a one of a kind Grimitives witch doll. She is a sweet witch with red hair, blue eyes... she sure will steal your heart! Wishing 2019 will bring much happiness to all. 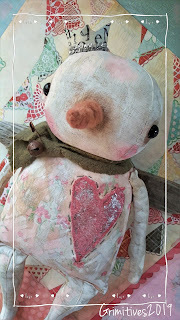 I'm starting the new year in the studio working on sweet snowgrimm angels. 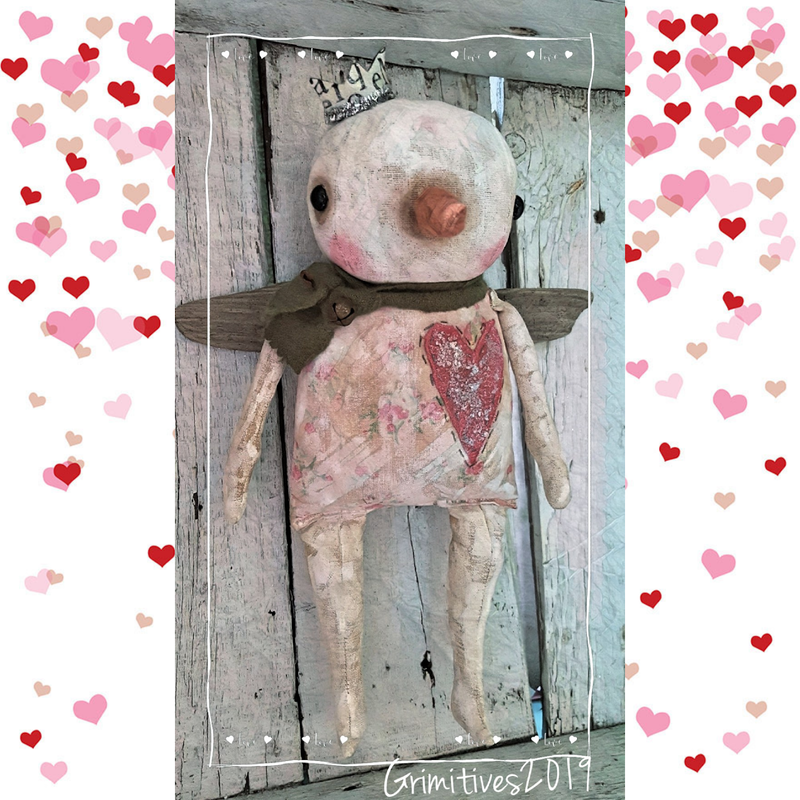 This snow angel is named Drift • her wings are made of drift wood from my favorite beaches on Cape Cod. 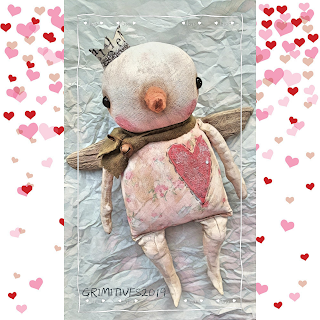 She is a chubby snow angel and made to hang for display• Doll size: 14 inches by 7 inches. Her body is made from fabric and painted white, grunged with a cinnamon grimmmix and sanded to age. 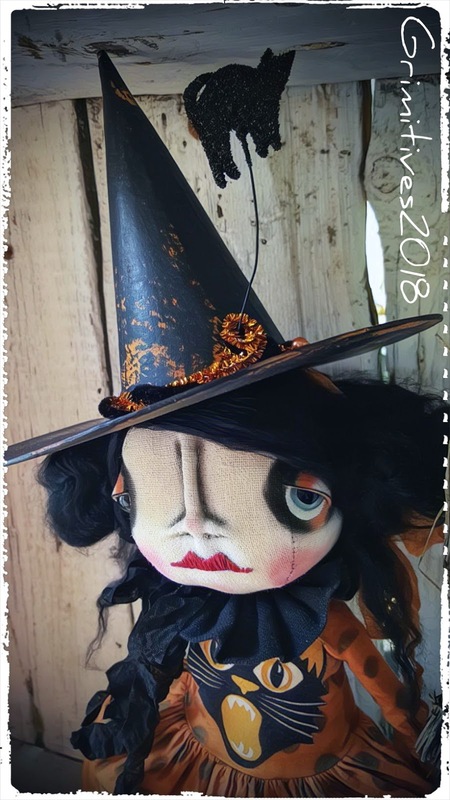 If you would like to order one like her please drop me an e-mail. 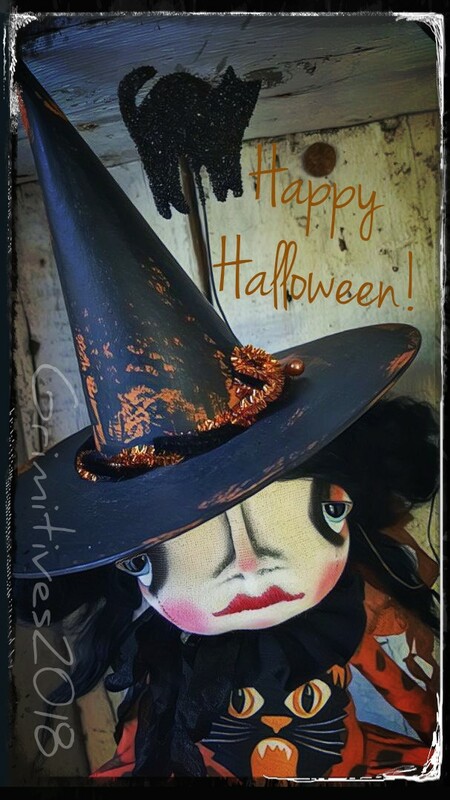 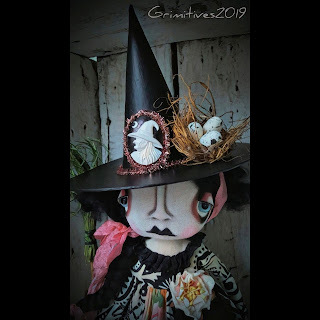 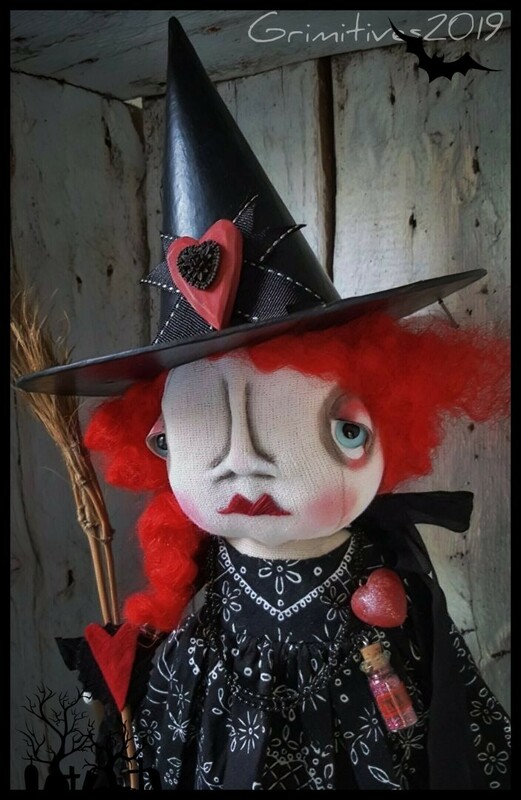 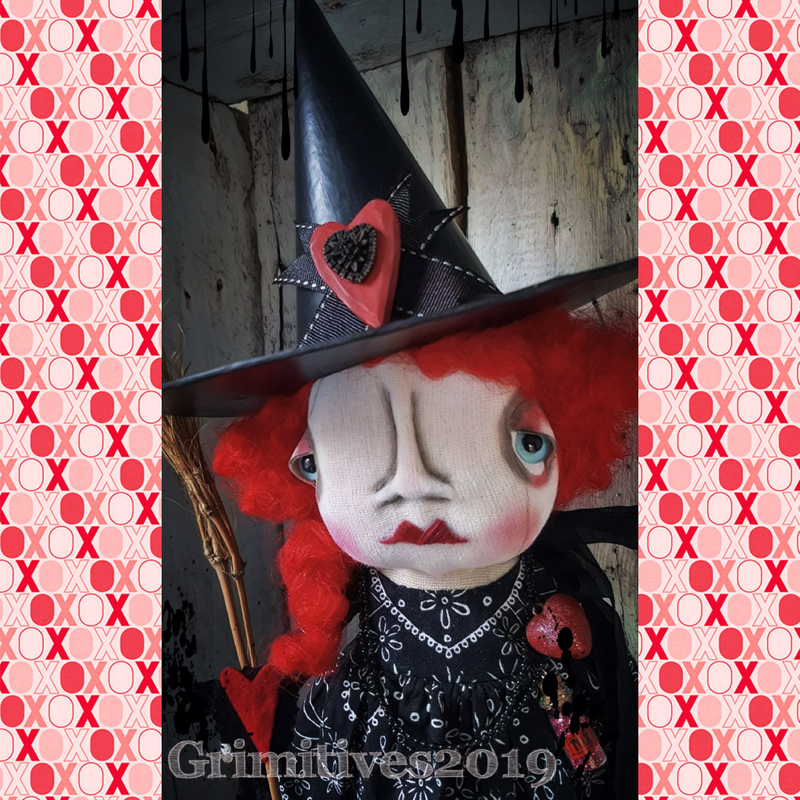 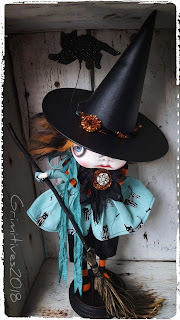 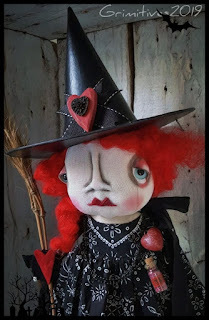 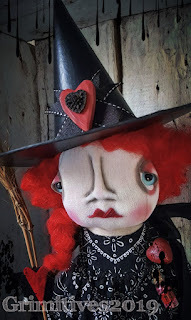 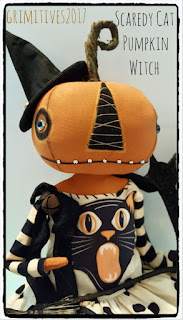 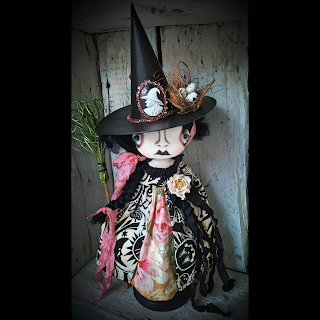 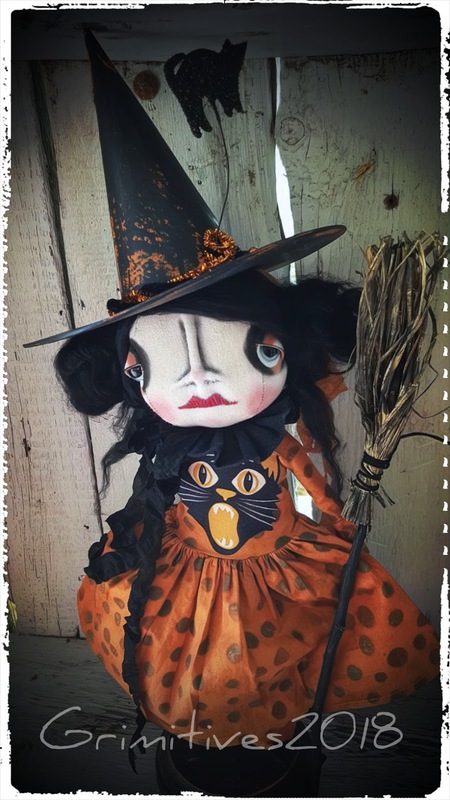 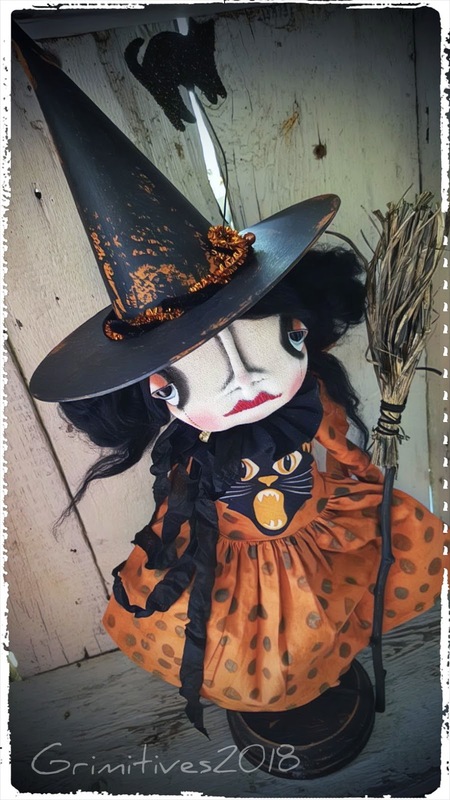 with free shipping within the U.S.
Grimitives offering this month is Witch Queenie Pyewacket. made with lots of halloween charm. 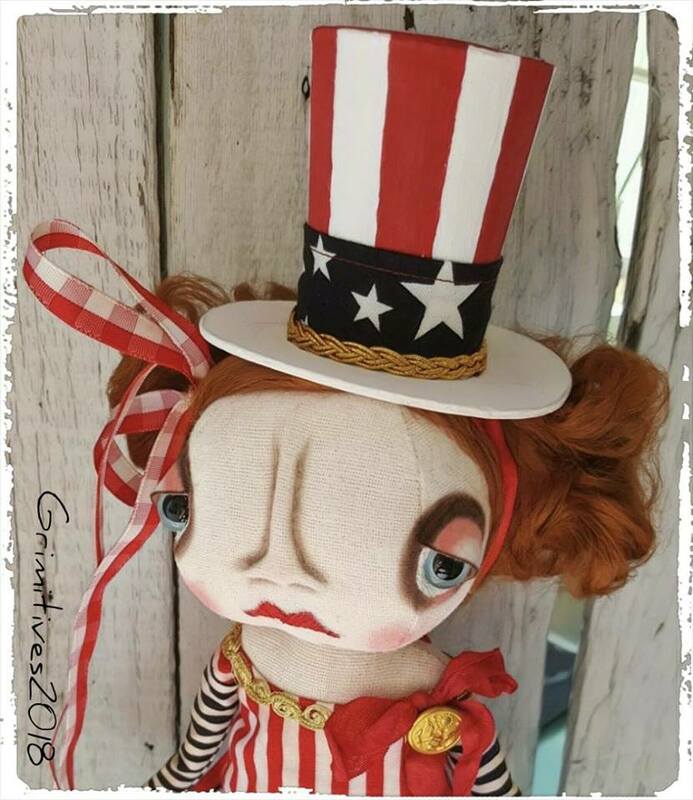 She measures 17 inches from hat to base and 14 inches from head to base. 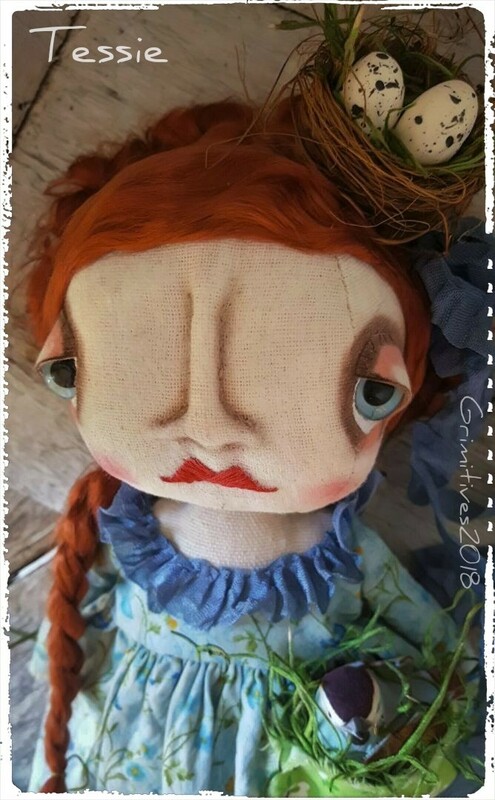 but I am working on more. 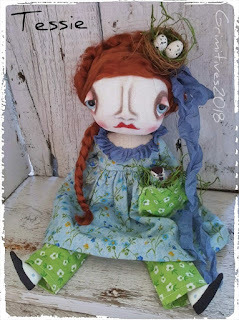 Sweet Tessie is Waiting for Spring. 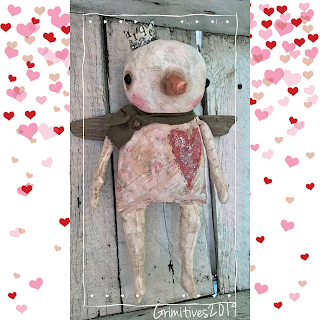 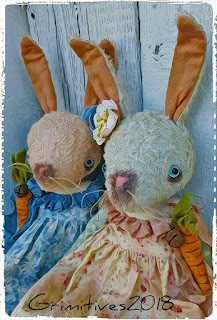 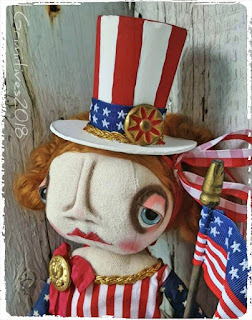 Tessie is available for adoption in my Grimitives etsy shop. 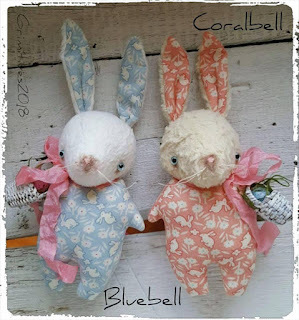 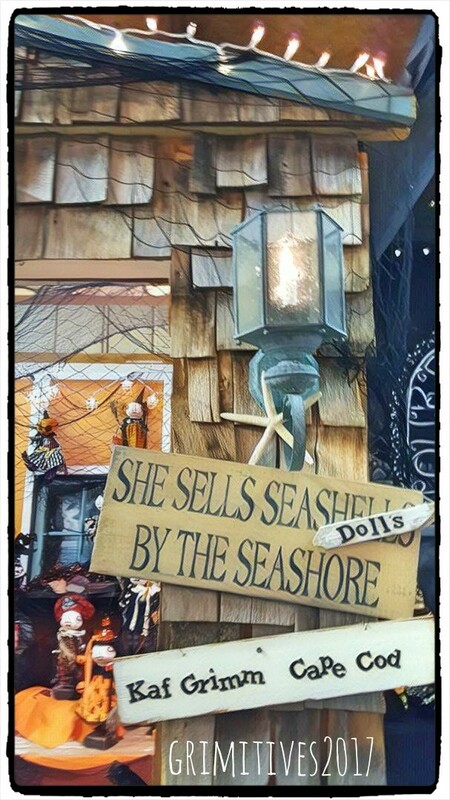 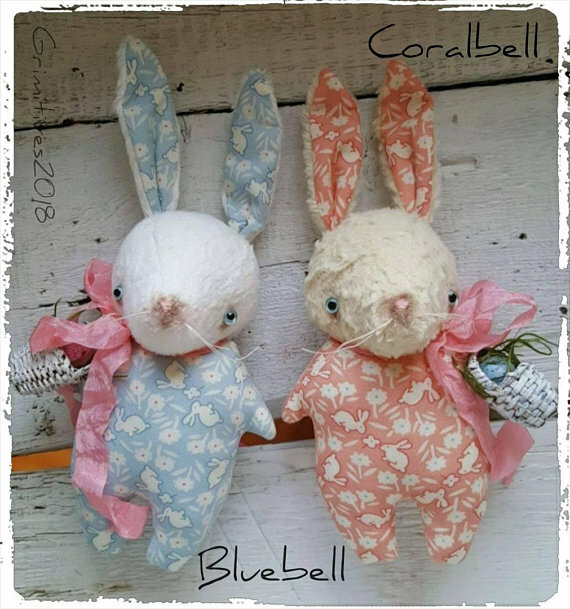 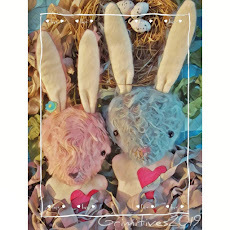 She is made with lots of love, a pinch of Springtime charm and Halloween delight. She measures 15 inches, from her hat to her feet. April has hand dyed pink hair, with ribbon/bow and one braid. 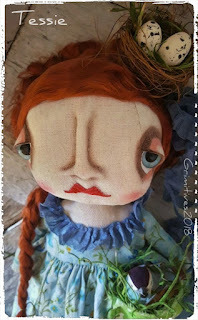 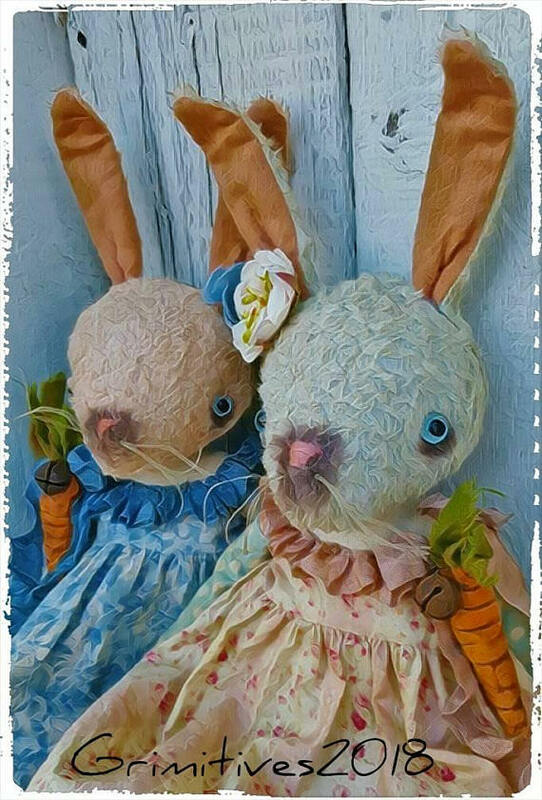 She has blue glass eyes,with my signature stitched eyelids & eye shading.Pinched stitched nose, black floss stitched lips, and her face has a dusting of blush. 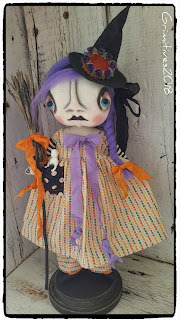 Her dress is made of vintage gingham fabric with stripe accent sleeves, vintage black ribbon. 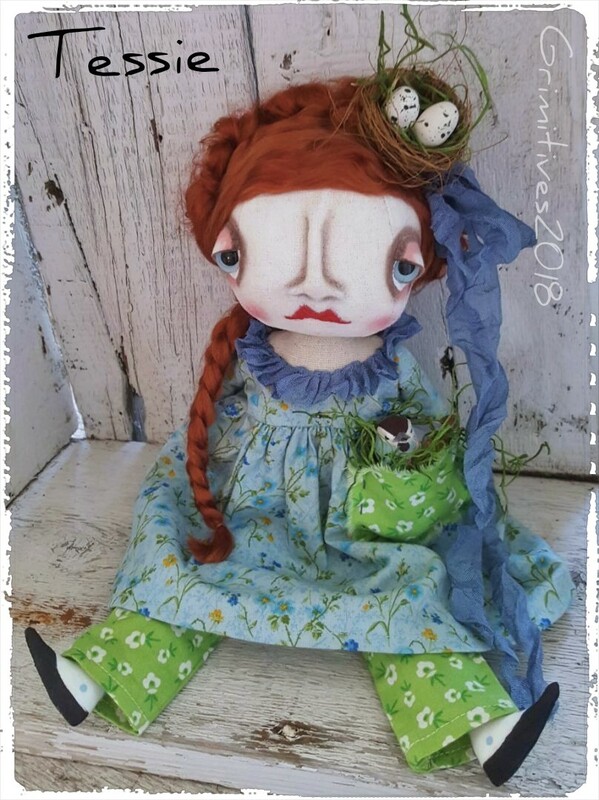 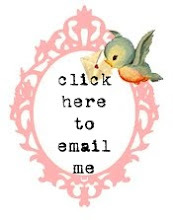 Her dress has a hand stitched on pocket with a pretty Springtime bird nestled in greens. 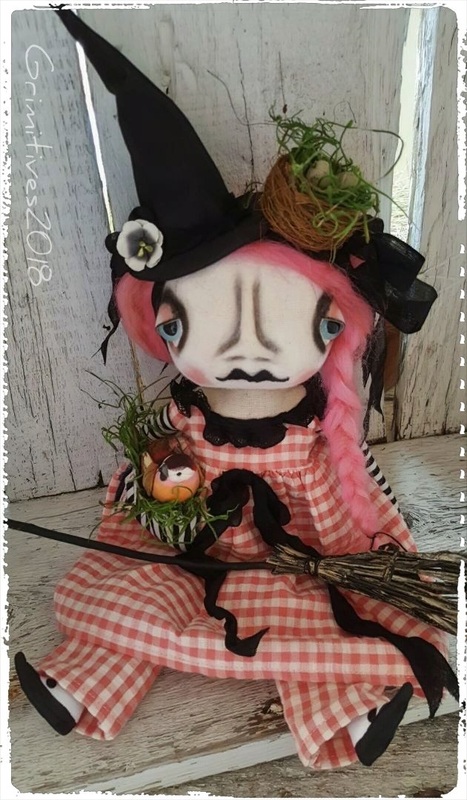 She has a witches hat and nest with eggs. Hat and nest are pinned to her head, and both can be removed. 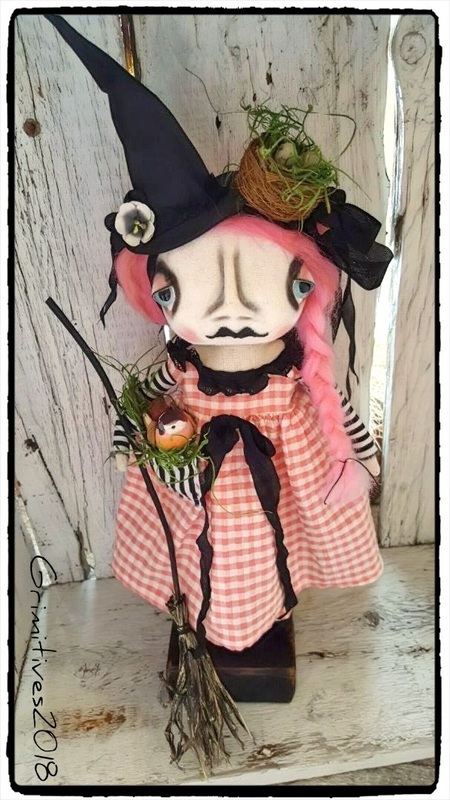 April comes with her own handmade wooden doll stand. 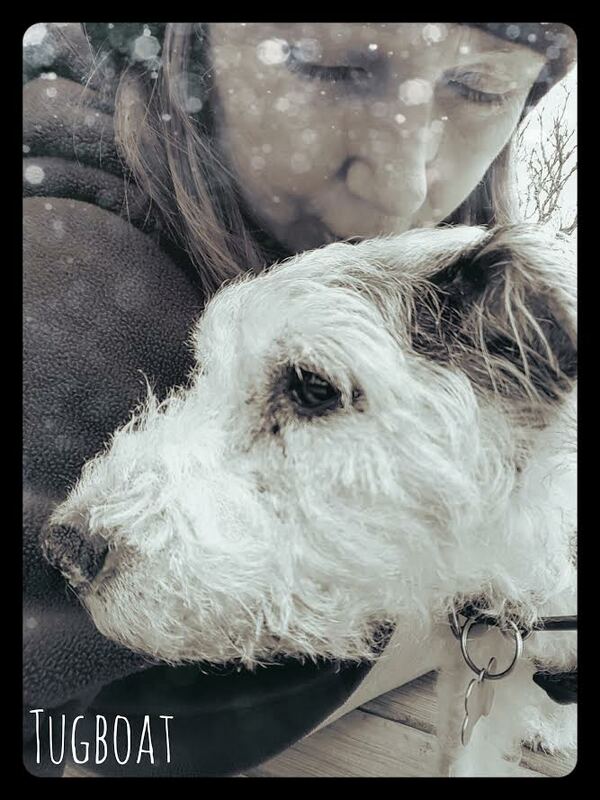 and I am finally feeling healthier. And I am thinking Spring! 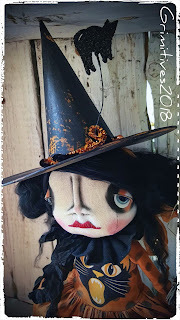 She is made to hang or she can sit. Approximately 15 inches tall from hat to feet. 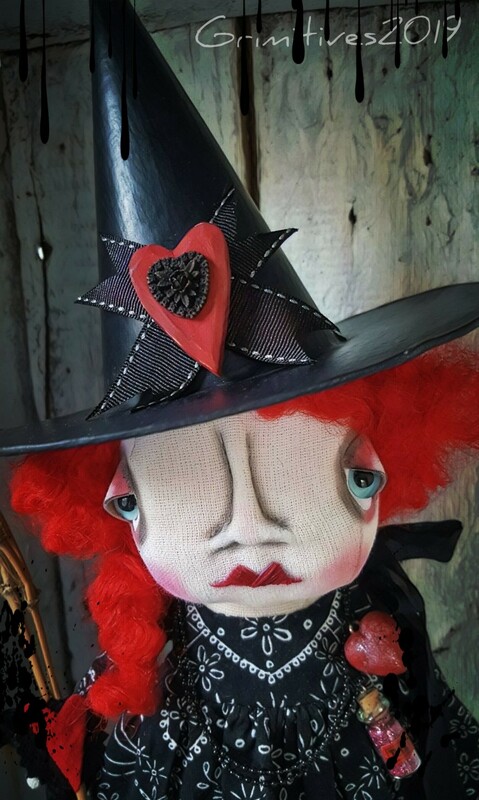 Pumpkin is made of cloth/painted. 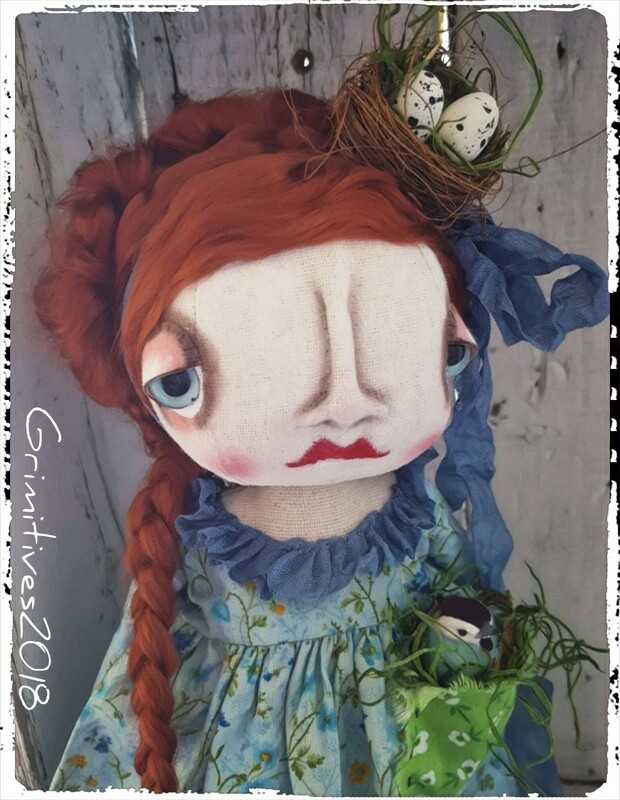 She has a handmade stem. 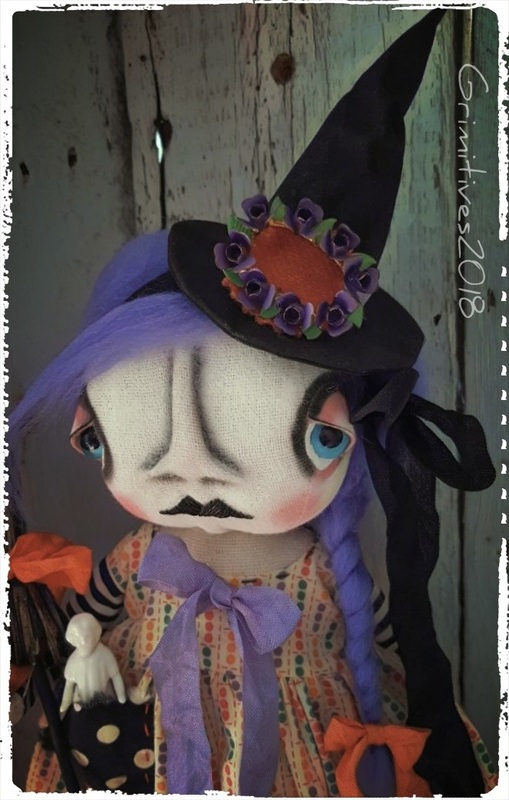 She has blue glass, stitched on black wool nose. 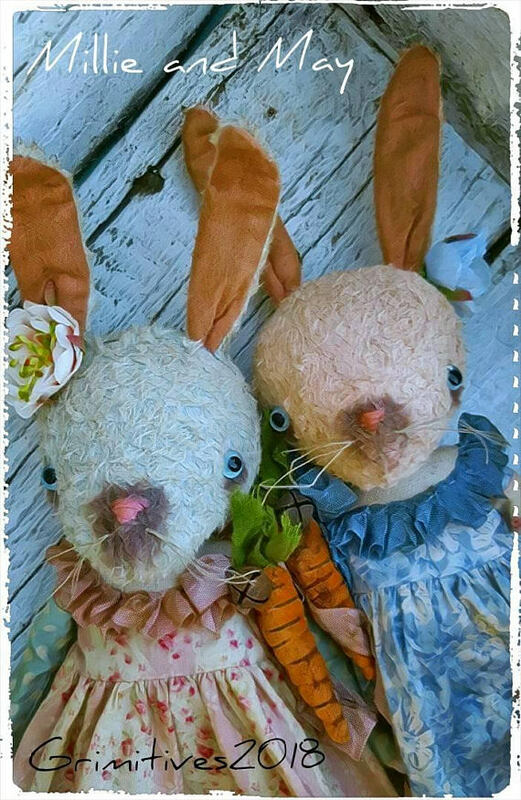 Wire mouth with tiny seed beads for teeth. 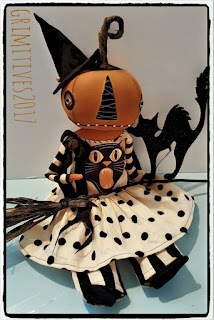 Her cat dress is made of polka dot and stripe fabric. 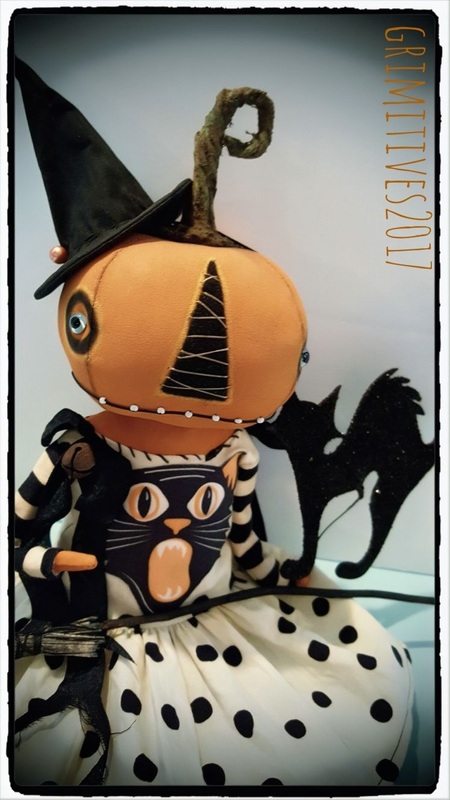 Attached to her hand is a black cat covered in black German glass glitter. 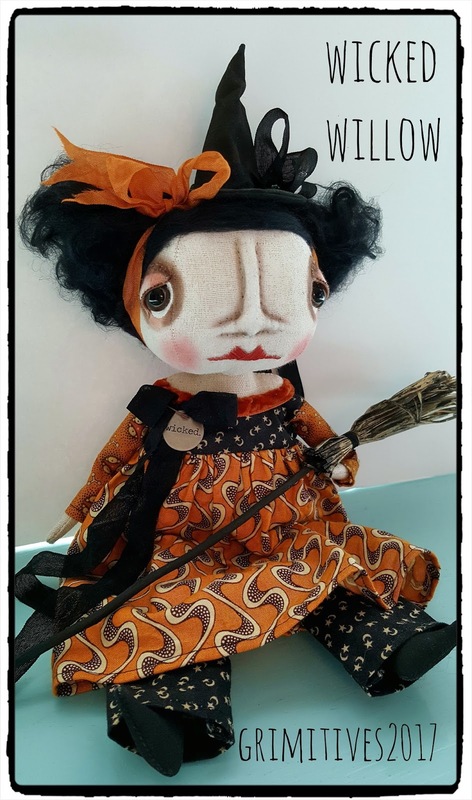 She has a broom and a witch hat. The hat is tied around her head and can be removed. 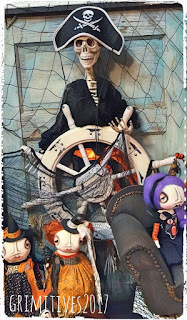 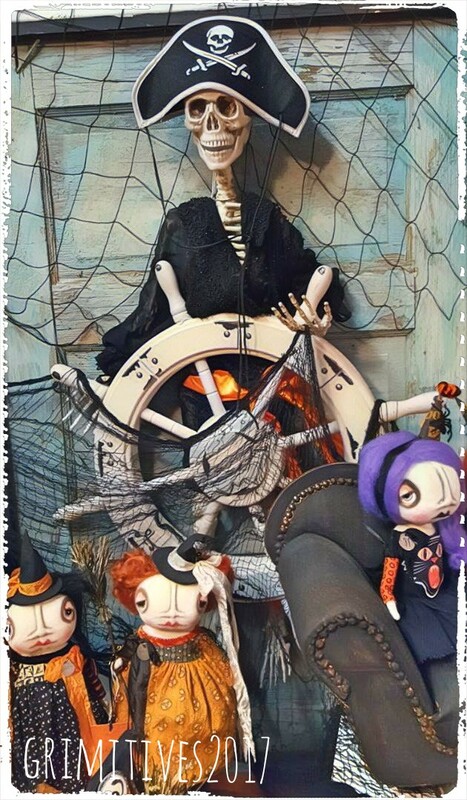 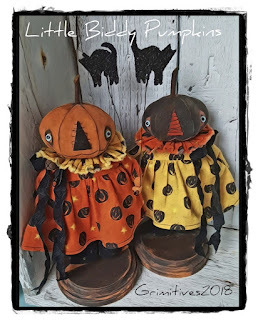 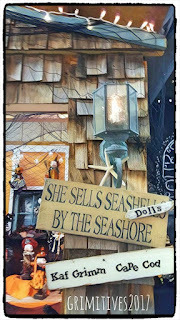 Shop has been updated with sweet Halloween Witches.